Dimensions 1.50 by 5.25 by 5.75 in. 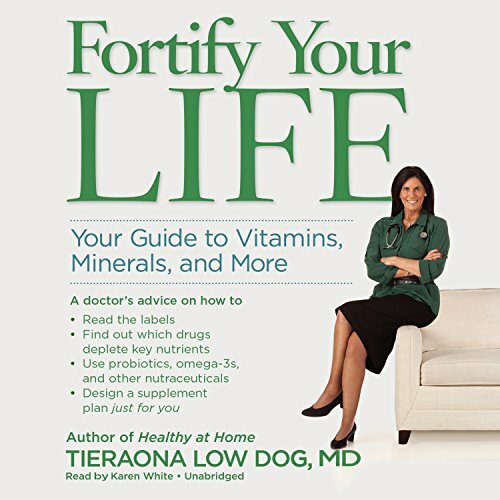 Amazon.com description: Product Description: Trusted natural health physician and bestselling author Tieraona Low Dog, MD, provides a personalized approach to using nutritional supplements for your specific health needs, helping you navigate the complex and often confusing landscape of vitamins, minerals, and more. Low Dog evaluates current research, explains the relationship between food and supplements, describes how medications cause chemical imbalances in the body, and advises on how to judge brands and read labels. Low Dog engages and encourages listeners to take charge of their own health and provides guidance to finding the right combination of nutritional supplements to improve mood, energy, and well-being.